Party noisemaker blowouts are so much fun to buy and enjoy with your family and friends.Every one enjoys them and they make it a party! Not a party without these!! I think these have been at every party the kids have ever had and are always welcome… for that one day!! The roll out bit gets damaged after a while but the noisy bit never ever breaks!! Always a fun bang with these. Never had an issue with these and they are at every family celebration. 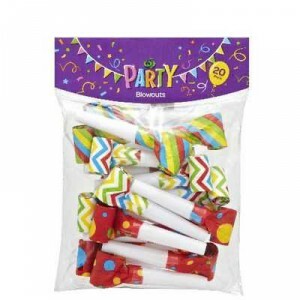 Perfect for kids lolly bags or New Year’s Eve to celebrate.these are great value and work well. Just ne wary – they can become very annoying! How would you rate Party Noisemaker Blowouts?